The annual gift tax exclusion increases for the first time since 2013 to $15,000 (up from $14,000 for 2017). It’s adjusted only in $1,000 increments, so it typically increases only every few years. The unified gift and estate tax exemption and the generation-skipping transfer (GST) tax exemption are both adjusted annually for inflation. For 2018 the amount is $5.60 million (up from $5.49 million for 2017). Tax-bracket thresholds increase for each filing status but, because they’re based on percentages, they increase more significantly for the higher brackets. For example, the top of the 10% bracket increases by $200 to $400, depending on filing status, but the top of the 35% bracket increases by $4,675 to $9,350, again depending on filing status. The personal and dependency exemption increases by $100, to $4,150 for 2018. The exemption is subject to a phaseout, which reduces exemptions by 2% for each $2,500 (or portion thereof) by which a taxpayer’s adjusted gross income (AGI) exceeds the applicable threshold (2% of each $1,250 for separate filers). For 2018, the phaseout starting points increase by $3,100 to $6,200, to AGI of $266,700 (singles), $293,350 (heads of households), $320,000 (joint filers), and $160,000 (separate filers). The exemption phases out completely at $389,200 (singles), $415,850 (heads of households), $442,500 (joint filers), and $221,250 (separate filers). Your AGI also may affect some of your itemized deductions. An AGI-based limit reduces certain otherwise allowable deductions by 3% of the amount by which a taxpayer’s AGI exceeds the applicable threshold (not to exceed 80% of otherwise allowable deductions). The thresholds are the same as for the personal and dependency exemption phaseout. Like the regular tax brackets, the AMT brackets are annually indexed for inflation. For 2018, the threshold for the 28% bracket increased by $3,700 for all filing statuses except married filing separately, which increased by half that amount. The AMT exemptions and exemption phaseouts are also indexed. The exemption amounts for 2018 are $55,400 for singles and heads of households and $86,200 for joint filers, increasing by $1,100 and $1,700, respectively, over 2017 amounts. The inflation-adjusted phaseout ranges for 2018 are $123,100–$344,700 (singles and heads of households) and $164,100–$508,900 (joint filers). Amounts for separate filers are half of those for joint filers. The maximum benefits of various education- and child-related breaks generally remain the same for 2018. But most of these breaks are limited based on the taxpayer’s modified adjusted gross income (MAGI). Taxpayers whose MAGIs are within the applicable phaseout range are eligible for a partial break — breaks are eliminated for those whose MAGIs exceed the top of the range. The American Opportunity credit. The MAGI phaseout ranges for this education credit (maximum $2,500 per eligible student) remain the same for 2018: $160,000–$180,000 for joint filers and $80,000–$90,000 for other filers. The Lifetime Learning credit. The MAGI phaseout ranges for this education credit (maximum $2,000 per tax return) increase for 2018; they’re $114,000–$134,000 for joint filers and $57,000–$67,000 for other filers — up $2,000 for joint filers and $1,000 for others. The adoption credit. The MAGI phaseout ranges for this credit also increase for 2018 — by $4,040, to $207,580–$247,580 for joint, head-of-household and single filers. The maximum credit increases by $270, to $13,840 for 2018. For a spouse who participates, the 2018 phaseout range limits increase by $2,000, to $101,000–$121,000. For a spouse who doesn’t participate, the 2018 phaseout range limits increase by $3,000, to $189,000–$199,000. 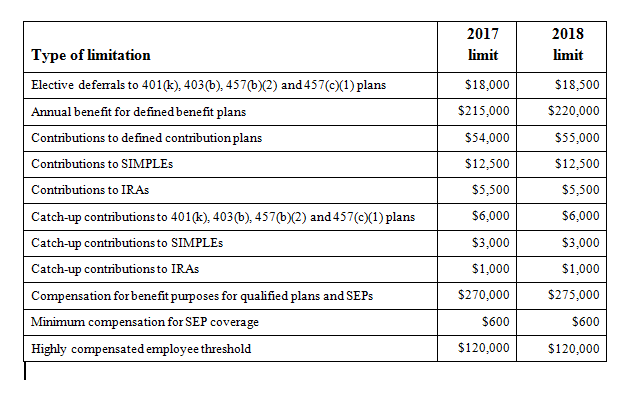 For single and head-of-household taxpayers participating in an employer-sponsored plan, the 2018 phaseout range limits increase by $1,000, to $63,000–$73,000. For married taxpayers filing jointly, the 2018 phaseout range limits increase by $3,000, to $189,000–$199,000. For single and head-of-household taxpayers, the 2018 phaseout range limits increase by $2,000, to $120,000–$135,000. The 2018 cost-of-living adjustment amounts are trending higher than 2017 amounts. How might these amounts affect your year-end tax planning or retirement planning? Contact us for answers. We’d be pleased to help.